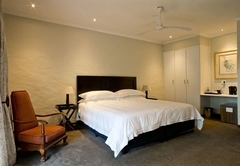 St Andrews Gardens is a Hurlingham Bed & Breakfast providing accommodation in 6 guest rooms for tourists visiting the Sandton region. 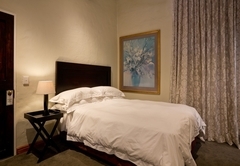 St Andrews Gardens B&B offers luxury bed and breakfast accommodation in the heart of Sandton. At St Andrews Gardens all guests are ensured an exceptional experience made memorable by our warm, attentive and personal service. 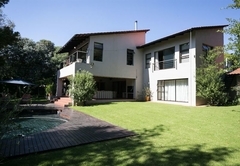 St Andrews Gardens is ideally located in the quiet suburb of Hurlingham, only two minute drive from the Sandton CBD. With access to all major business districts, highways, in close proximity to the Gautrain (falls within the designated bus route traveling from the Sandton Gautrain station) and only 30 minutes from OR Tambo or Lanseria International Airports, it's the perfect retreat for your needs. 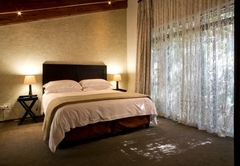 The warm ambience and elegant style is perfect for the executive on business or a leisurely stay. Relax around the pool deck and soak away the day in our crystal clear rock pool. 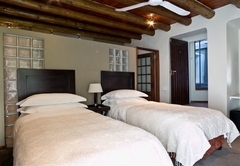 The executive rooms (some with shower only and others with bath and shower) are furnished with king size or twin beds, the standard rooms with queen size beds and the single rooms with a single bed. Each room has a dressing table / desk to use as a work area and its own electronic wall safe for all your valuables. For our guests’ peace of mind we offer secure 24 hour parking with a CCTV security system monitoring the premises at all times. 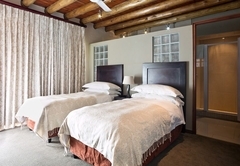 We are able to offer both short and extended stays at your request. Breakfast is served between 07h00 and 09h00 or earlier by request, where a choice of either a hot or cold breakfast will be served. Breakfast can be enjoyed inside the dining room or on the patio overlooking the magnificent gardens. 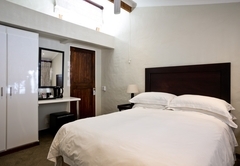 Executive Room with king size bed (or twin on request) and en-suite bathroom. LCD Flat screen TV (selected DSTV channels), Wi-Fi, ceiling fan and heater. Dressing table/desk work area and electronic wall safe. Secure 24 hour parking with CCTV security. 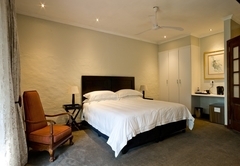 Executive Room with king size bed (or twin on request) and en-suite shower. LCD Flat screen TV (selected DSTV channels), Wi-Fi, ceiling fan and heater. Dressing table/desk work area and electronic wall safe. Secure 24 hour parking with CCTV security. 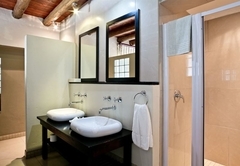 Standard Room with queen size bed and en-suite shower. LCD Flat screen TV (selected DSTV channels), Wi-Fi, ceiling fan and heater. Dressing table/desk work area and electronic wall safe. Secure 24 hour parking with CCTV security. Response timeSt Andrews Gardens typically responds to requests in 5-10 minutes.